El Regalo is a 35 ft. Cabo Flybridge that's near perfection for sportfishing in the waters where it earned its name. The hardware is top of the line, and selected for maximum durability. El Regalo is equipped with air conditioning, water maker, Sirius XM radio with bluetooth, underwater lights, refrigerated holds, tuna tubes, two separate bait tanks, all Furuno electronics in range, GPS, navnet chart plotter, and fish finders. The engines are brand new 480 hp Cummins turbocharged diesels, and the boat has a 13 foot beam for a stable fishing platform. Los Cabos, a global hub of sportfishing, is home to IGFA records for: yellowtail tuna, wahoo, jacks, rooster fish and yellowtail. Sailfish, marlin and dorado are also found in record contending size. With the awe-inspiring area providing some of the world’s best fishing, it is crucial that you have top rated equipment and a crew that understands exactly what kind of charter you are seeking. To that end, we provide kite fishing and fly fishing, as well as, conventional lure and bait options to give you the charter that you seek. Whether catching a roosterfish on the fly, dorado on light tackle or battling a monster marlin or tuna, the professionals on EL REGALO look forward to making your fishing dreams come true. Based out of Costa Palmas marina, EL REGALO charters on the East Cape with pick up available from resorts such as Palmas de Cortez, Rancho Leonero, and Hotel Buena Vista Beach Resort. We also service out of the Cabo San Lucas Marina during the winter for your convenience and seasonally run charters out of Magdalena Bay. High end tackle: Accurate, Shimano, Penn Reels. Calstar and Seeker Rods. 100% Fluorocarbon Leaders with ultra-low visibility and superior strength. Owner and Gamakatsu Hooks. A standard charter includes light snacks (granola bars, fruit, and bottled water). Rates do not include 16% IVA tax, bait (about $20.00 USD. ), Mexican fishing license, additional food/beverages or gratuities for the captain or guide. For custom charters, there's a queen sized cabin for over night trips and a cabin with bunks. Fly fishing focused charters are available (to be accompanied by a US fly fishing guide aboard EL REGALO add $150.00 USD). El Regalo is owned and operated by Matthew Clifton and Arturo Silva. An East Cape native from Los Barriles, Captain Arturo is bilingual, and a 4th generation fisherman with experience ranging from casting off shore to piloting the large yachts of Cabo. His love for the region runs deep and is only matched by his experience and knowledge of when, where, and how to fish these waters. Matthew Clifton is an attorney turned fly fishing guide and charter operator. Soon after entering the practice, he decided that he wanted to follow his dream of fishing for a living. 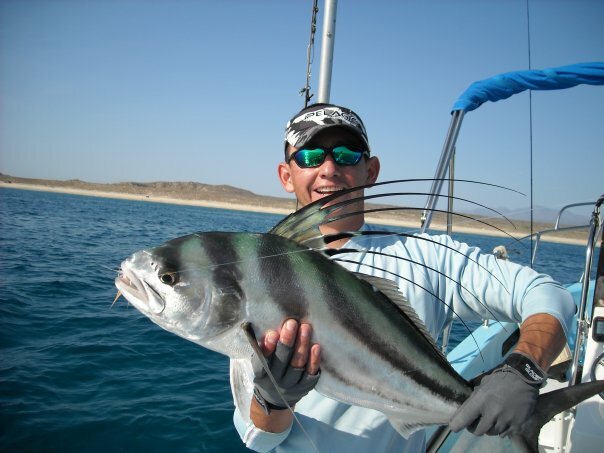 After several years of operating a fly fishing lodge (www.octagoninn.com) and guide service on the San Juan River in New Mexico, Matthew fell in love with Los Cabos and its productive fishing waters. Should you desire a fly fishing guide for your trip, Matthew would be available for a additional guide fee of $150, which would include all fly gear. Working together, Matthew, Arturo and first mate Jorge will ensure that your charter is one of the finest in all of Baja. All crew is bilingual in English and Spanish.